The essential GM's reference to Star Wars: Age of Rebellion. 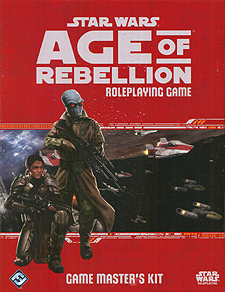 Take your Star Wars: Age of Rebellion campaign to the next level with the Age of Rebellion Game Master's Kit. The forces of the Empire are fearless and plentiful, but with the rules for forming squads and squadrons found within, players can take on these overwhelming forces alongside formations of allies. The kit also contains a brand new adventure, new rules and advice for GMs, and a deluxe Game Master's Screen that places the most commonly referenced rules close at hand. This product includes a 32-page book and a 4-panel Game Master's screen. A copy of the Age of Rebellion Roleplaying Game core rulebook is required to use this supplement.